Membrane - D. I. Engineering Co. Ltd. The TurboClean advanced design (patent pending) provides improved performance over the standard cage wrap sanitary design. A new generation of parallel design feedspacers to reduce fouling and improve cleaning and sanitization. The TurboClean design provides for greater turbulence in the bypass flow. 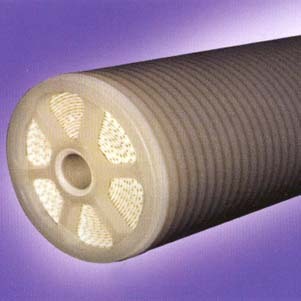 This high velocity vortex flow results in a constant scrubbing of the exterior of the membrane element. Machined to strict tolerances to produce precise bypass flow characteristics. This design eliminates the inconsistent bypass flow rates inherent in the cage wrap element designs. The hard polypropylene outer shell protects the membrane from damage and provides superior structural strength to the element when exposed to high differential pressure loads. Precision manufactured design allows for easier element loading and unloading of pr3essure vessels without field modification. Elements may be easily cleaned and sanitized in place, resulting in less plant down time and reduced operating expense. Can also be ordered with optional high temperature construction and polysulfone components, making it hot water sanitizable. The TurboClean's superior appearance inspires confidence in product quality.